Part of the BOSS Legend Series, the FBM-1 pedal captures the essence of the ’59 Bassman in both looks and sound. Its beige color and shiny metal control plate evoke the tweed covering and chrome faceplate of the real ’59, and even the Fender and Bassman logos are period perfect. 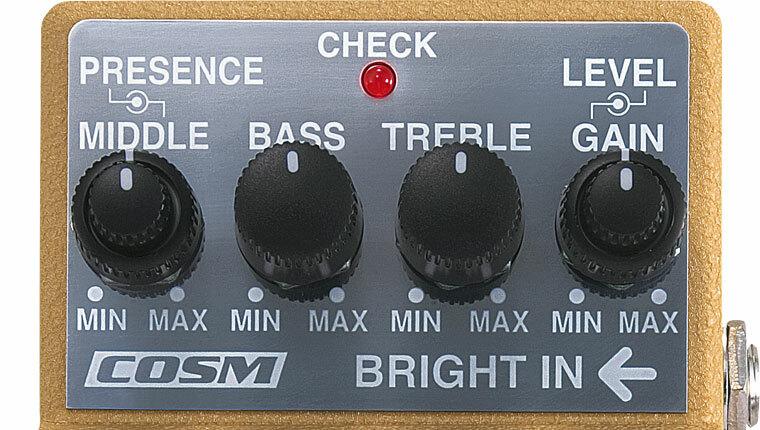 Like the original amp, there’s a normal input, along with a second “bright” input that offers increased treble. The tone section follows the lead of the original as well, with Bass, Middle, Treble, and Presence controls, and their sound mimics the response of an actual Bassman. 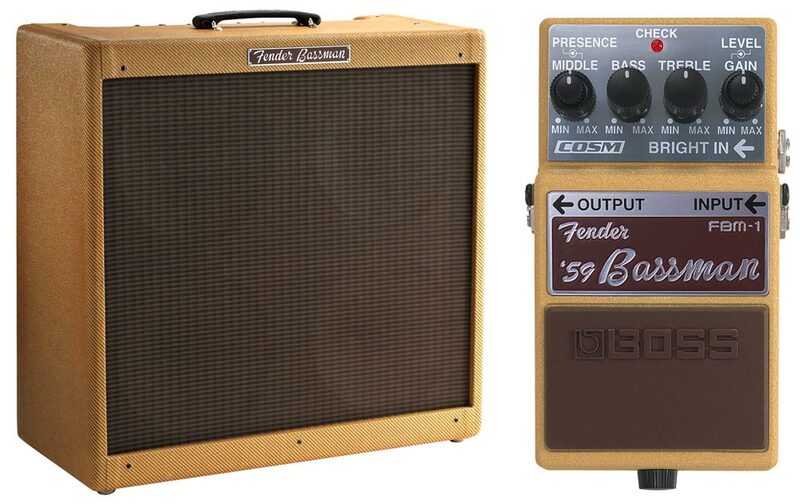 The BOSS FBM-1 pedal captures the sound and look of the classic Fender ’59 Bassman amp. The ’59 Bassman amp has no master volume control like most modern amps have, so its rich distortion sound can only be achieved by cranking the amp to loud levels. The FBM-1 solves this with two volume controls: the Gain knob replicates the Bassman’s volume control and allows you to dial in the desired amount of distortion, while the Level knob lets you adjust the overall volume of the pedal. At low Gain settings, the sound is clean, yet rich and sweet. As you crank it up, the sound gets thicker and more distorted just like the Bassman itself. Panel knobs on the BOSS FBM-1 Fender ’59 Bassman pedal. For the most authentic Fender amp emulations, it’s best to use the FBM-1 with a guitar amp that’s set clean, and with its tone controls adjusted to deliver a fairly “flat” sound. This gives this Legend Series pedal a neutral, uncolored tonal slate to impart their vintage Fender mojo upon. A clean amp like the JC-120 works great for this, but any amp set clean and flat should work just as well. That said, we also recommend that you try out the FBM-1 as a Fender-flavored tone shaper for your regular guitar amp setup. For example, you could set your amp with just a hint of distortion, and then use the FBM-1 to launch it into overdrive-land for crunchy rhythm and searing solos. This method of using a pedal to “kick the front end” of an amp on the edge is a popular trick among tone-savvy guitarists, and it can be accomplished with any BOSS overdrive or distortion. However, using the FBM-1 in this application adds a huge dose of classic Fender goodness along with the kick. For more of a Blackface-era Fender tone, be sure to check out another member of the BOSS Legend Series, the FDR-1 Fender ’65 Deluxe Reverb stomp. Fender and Bassman are trademarks of FMIC.